Touch 'n Seal products are ideal for air sealing homes and buildings. Applying fast-curing Touch 'n Seal Two Component Spray Polyurethane Foam on attic floors prior to installing blown-in or batt insulation provides protection against air leaks. 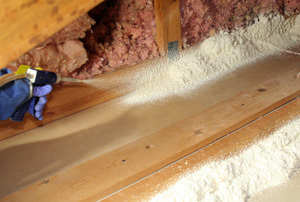 Unlike fiber insulation alone, Touch 'n Seal Spray Polyurethane Foam greatly reduces air transmission between the conditioned livings space and the attic, which can account for a large portion of energy loss. Sealing joints and penetrations around rigid metal HVAC ducts with Touch 'n Seal Two Component Spray Polyurethane Foam in un-conditioned attics and crawl spaces will reduce energy loss, provide greater comfort, and increase the efficiency of the HVAC system. Sealing around exhaust fan ducts can help prevent condensation and dripping back through the fan assembly. Air leaks in basements has a negative impact on the energy efficiency of homes. Touch 'n Seal Two Component Spray Polyurethane Foam provides a continuous bead of rigid foam that helps keeps air, dirt and insects out of basements. 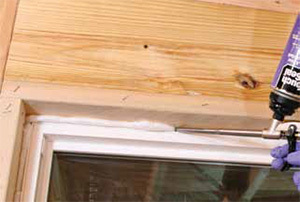 Touch 'n Seal No Warp Window & Door Insulating Sealant expands without exerting pressure that could distort the frame. 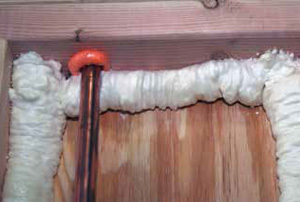 The cured rigid foam sealant maintains its shape to create a permanent water resistant seal. All Seasons Polyurethane Foam Sealant can be used for windows and doors when temperatures are as low as -7ºC (20ºF). 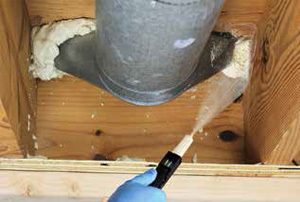 Touch 'n Seal one-component Quick Cure Polyurethane Foam Sealants are especially suited for air sealing band joists/sill plates, attic floors (prior to installing fiber insulation), and other smaller projects. Sealing the perimeter of each stud bay lowers the infiltration rates to meet the most stringent energy code requirements using fiber insulation. Touch 'n Seal Gun Foam II Polyurethane Foam Sealant should be used to fill spaces around penetrations between rooms and floors as an important part of fire safety. Two Component Spray Polyurethane Foam is appropriate for larger air-sealing jobs and projects and when quick, chemical curing is needed.